Objective: To explore the application of laparoscopic technology in the operation of urachal remnants. 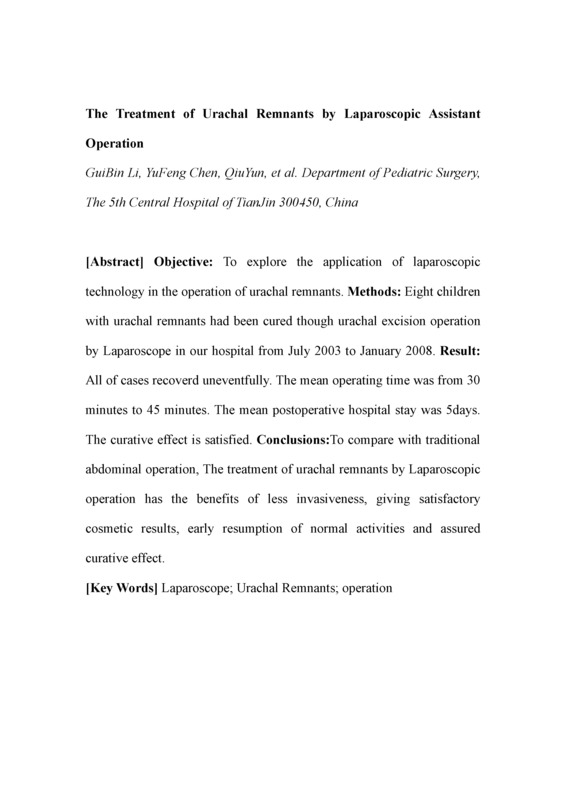 Methods: Eight children with urachal remnants had been cured though urachal excision operation by Laparoscope in our hospital from july 2003 to January 2008. Result: All of cases recoverd uneventfully. The mean operating time was from 30 minutes to 45 minutes. The mean postoperative hospital stay was 5days. The curative effect is satisfied. Conclusions:To compare with traditional abdominal operation, The treatment of urachal remnants by Laparoscopic operation has the benefits of less invasiveness, giving satisfactory cosmetic results, early resumption of normal activities and assured curative effect.